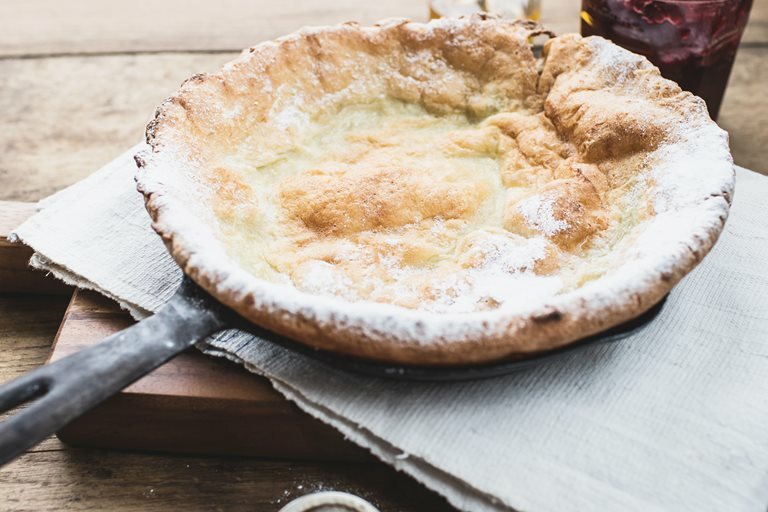 A cross between a crepe and a Yorkshire pudding, this dairy free Dutch Baby Pancake would make a great alternative to the usual pancakes for Shrove Tuesday. 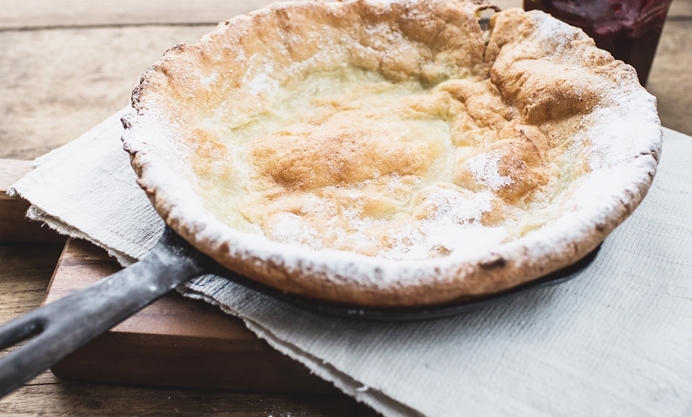 This large, lovely pancake I think of as a cross between a crepe and a Yorkshire pudding. An unleavened, thin batter is poured into a piping hot, generously oiled pan and then placed into the oven instead of being cooked on the stove. The edges of the batter puff up, becoming crispy and golden while the middle remains paler and slightly chewy. It's easy to load the toppings on here - if you're stuck for ideas just think of your usual crepe fillings: jams, nut butter, chocolate chips, lemon with sugar, maple syrup or fresh fruit. I personally like to shower the pancake in icing sugar and squeeze on some lemon juice. This is enough to make one large Dutch baby, serving 4 people. For a smaller serving only make 1/3 of the recipe and use a 20 cm frying pan, then bake for 10-15 minutes. I have recommended using a 30 cm frying pan only as a guideline. If your pan is a little larger or smaller, it will work just as well. Izy is a student living in London, who spends her spare time blogging and photographing. She recently finished writing her first cookbook, Top With Cinnamon.